I’ve been playing a fair bit of competitive Overwatch this season in a bid to try and improve my rank and overall gameplay. I’m someone who likes to try and communicate a little bit whilst playing, but I’m not overly chatty, generally it’s just call outs about the enemies where abouts and trying to combo ults or pushes as a team. But I’m stuck, I’m stuck in silver and I’m starting to feel like it’s not my fault. I’m not the greatest player I admit that, but I’m good enough to hold my own and this is one of the reasons why I feel like ranking up is, in part, out of my hands. It’s a gamble whether I will have a team that wants to play together, or whether I’ll have someone who tilts after 2 minutes and quits. The matchmaking this season feels completely random, teams can be put against each other with huge SR gaps between them. But it’s mostly that people just want to do whatever they feel like with no consideration of what the team might need – in a nutshell people pick their ‘main’ and stick to it no matter what. Some of you may be aware of a Youtuber called Stylosa who runs the channel Unit Lost Gaming, he does a great coaching series called Overanalysed, where players send in footage of their games and he comments on them in a bid to help the improve and go up the rankings. I’ve watched almost all of these videos and have a good understanding of what I should be doing with the characters I use the most, but it’s becoming clear, that just relying on improving on a personal level isn’t enough. I just don’t understand why people play a team based game in competitive when they don’t want to work as a team. Now, if Overwatch was a game where you could carry others on the back of killstreaks as you can in something like COD or CSGO, then I’d be ok with it. 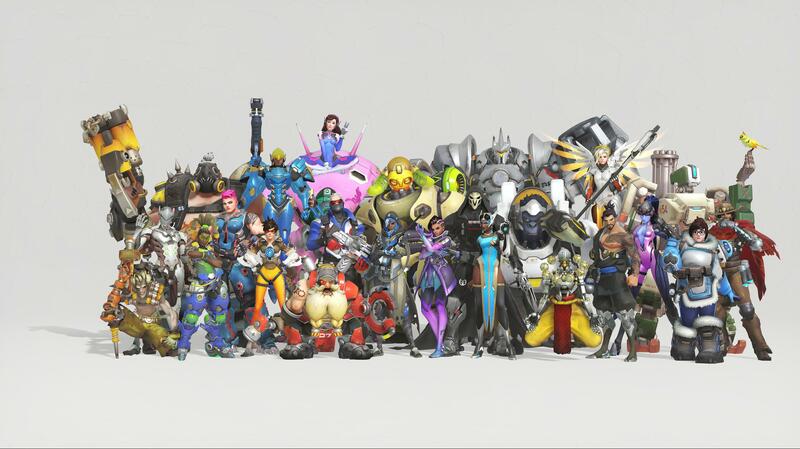 But Overwatch is a team game made up of multiple roles that people will need to play in order to stand chance. If you have a bad composition and no communication, chances are, you’re going to have a bad time. I’m not asking people to tell me their life story whilst playing, hell you don’t even have to say a word, but at least listen to the people that are talking and trying to help you. If I’m asking you to group so we can push as a team, do it! I’m not the type of person to instantly tell someone to switch if they pick Hanzo, because you might be a great Hanzo and terrible with anyone else, that’s fine we can make it work, but you still need to work as a team. Surely these YOLO players want to win as well? It’s also helpful if people can play a couple of heroes with some degree of knowledge. But way too often, as I mentioned, people load in insta-lock their ‘main’ and refuse to switch, but they’re happy to tell everyone else who they should pick. This is also becoming more of an issues because players who switch or ‘flex’ to other heroes in games get punished more for a loss. This is due to the way SR works, very simply put, SR compares your performance to others who play the same hero at the same level as you. So if say, half way through a game you switch from Mercy to a DPS character, your stats for the DPS character won’t look as good as someone who’s played the whole game as that character, therefore meaning it looks like you didn’t play as well so you lose more SR. This is clearly causing people to staunchly stay with whatever hero they pick at the start and it’s a problem that needs addressing. After Overwatch is a team game, and players who are working to try and create a better team by switching should not be punished for it. I don’t know what the answer is here, but it’s really starting to make me not enjoy competitive Overwatch. Simply put, it’s super accessible to everybody and people play ranked because it feels good. When you play a competitive, team-driven title such as OW, you will have to expect that not everyone will want to play at your level (Even if they’re somehow up to your rank). Interestingly, I read a looong time ago, that in League of Legends, it was around their silver ranks that the gameplay sorta got… Bad. Well no: Playable, but incredibly average – But most importantly, there was a lack of communication and a lot more pinging one another if a player sees a mistake (but not improving their own). Good luck: But don’t be discouraged! I hope it gets better, lol. If it doesn’t then I will probably just stop playing in comp. I keep on plugging away though! Sigh. I hear you, my friend. For the first time ever, I ranked up to platinum this season, but it felt like such a crapshoot. A few seasons ago, I ranked in at BRONZE. I wanted to die. It’s very unreliable, and like you said, there’s isn’t much of an answer (short of never solo-queueing, which I’m not suggesting – I basically only solo-queue). Non communication is frustrating – I’m the same as you, I don’t immediately flame Hanzos, and I’m never dictating instructions, but calling out enemies and ults requires minimal effort and goes a long way. On the other hand, I’ve had matches where we’re all on the same page without communicating somehow, and inversely, matches where it’s 5 toxic people all blaming one another and causing me to play like crap. Who do you typically use? I made Mercy my comp main a long time ago – I decided to work on someone essentially every team needs, and doesn’t always have. More often than not, a decent team comp falls into place when I immediately auto pick her – people seem relieved the healer aspect is taken care of, and pick accordingly. The flip side is, if we’re losing, unless someone else switches to healer, I’m stuck on the sinking ship as a healer – I can’t take a crack at DPS or we’d really be screwed. My strategy nowadays is play a comp match or two and get a feel for what the comp “tone” will be for that particular sitting. If I suffer a miserable couple of losses, or notice I’m not playing well, I’ll switch to quick play or arcade and have a stress-free Overwatch sitting. The ideal scenario is a handful of people are in chat, they’re not toxic, they’re capable and willing to team up. Stick with them for 5 or 6 rounds, and I’ve just thrown another 100+ SR onto my rank. It’s weird how it’s almost like gambling – when you win, you want to chase the high and add to your rank. When you’re in a losing spiral, you think if you just win one, you’ll feel that much better. The key for me has been knowing when my own gameplay is suffering, whether because of my actions or teammates, and switching modes. Sorry for lengthy response. Great post – really resonated with me and I guess I had a lot to say! Best of luck, you seem like a great teammate to have who is overdue for a wave of good fortune. I guess I main Lucio – he’s my most played, he covers the healer spot and I can protect myself pretty well, plus I know how to use him effectively – for the most part. I think one problem I have is sometimes I play until I get the win and that can take 6-7 games and it’s just so deflating. I should probably take a leaf from your book and play one or two games then stop. The often-thankless job of healer can sour the results too sometimes, win or lose. You’ll get there!